Free Shipping Included! CNAweb 12U 19'' Slim SoHo Wall Mount Rack Cabinet Enclosure 6'' Depth - Black by CNAWEB at Learning Delphi. MPN: CNA604968. Hurry! Limited time offer. Offer valid only while supplies last. 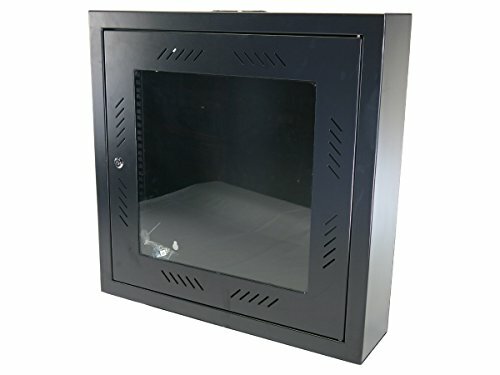 19'' 12U wall mount cabinet enclosure designed for network closets and education environments, where equipment is required to be organized and secure. 19" 12U wall mount cabinet enclosure designed for network closets and education environments, where equipment is required to be organized and secure. Ventilated panel for increased airflow. Interior vertical posts have square holes for included cage nuts and mounting screws. Shipped fully assembled for quick installation. 12U slim soho wall mount design, great for hub, modem, router and DVR!